When the school opened in 1930, it was on the very edge of the city. The tram lines that came from the city centre ended at the nearby Bagot Arms pub. From the school and across Gunter Road, behind the newly built houses, were green fields where Hardy Spicer factory now is. The large Castle Vale estate did not exist, there was a small aerodrome there, [called Castle Bromwich Airfield]. Nearby was the very popular Birmingham Horse Racing Course. At that time the county was called Warwickshire, later this part of Birmingham became part of the new county of West Midlands. Many of the families that moved into the new estate of Pype Hayes came from the inner city, where the houses were old, in very poor condition, and needed to be demolished. For many it was like moving into paradise with indoor toilets, green spaces, and wide roads - most were very proud of being the first residents of Pype Hayes. Mr Cook who came to this school in 1930 told us that when they moved into their new house they all took turns to turn the electric lights on and off, and how his mother cried with happiness when she saw that the family had a bathroom of their own. The local houses were owned by the council and rented by the families - all of these houses were demolished 70 years later to be replaced by a new estate. We have been told, (looking at the building supports this) that the school should have had an entrance at what is now the back of the school. A drive and gateway should also have been built on Tyburn Road for the school. We do not know for certain why these were not built - one story says that the company which built the school simply ran out of money after the construction of the school hall turned out to be much more expensive than expected. Until 1999 the school did not have a main entrance because of this. The school hall is made from railway viaduct arches - probably from Saltley. It is a very large and high hall. There was a stage with wings and curtains, this was altered to an 'open' stage in the 1970s. The back of the school was open, the wooden classroom walls were the outside walls, there was no corridor. It was often very cold in the classrooms during winter. The headteacher's room and the staffroom had coal fires. It was the job of one of the older children to 'set the fire' ready for it to be lit by Mr. Davies when he arrived. The toilets were at the back of the school along the wall - outside toilets! Mr. Fred Davies (Headteacher) stands outside the new school. I think this photograph might have been taken in 1930. There is no grass, mud tracks are on the drive, (builder's lorries? ), the windows are open, (drying paint?). The number of children in school - the 'school roll' - increased very fast as the new estate was opened : 30 June 1930 - 182 children : 4 July - 205 : 18 July - 351 : 17 October - 412. There was not a nursery class at this time. 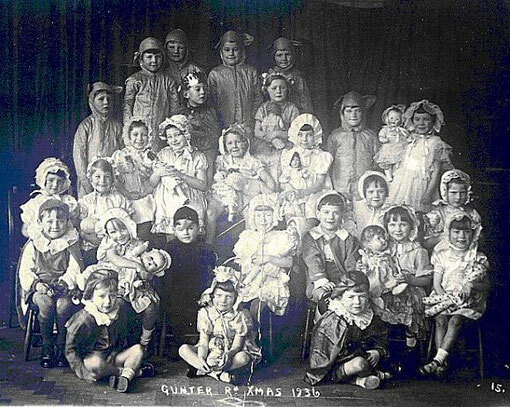 By mid 1931 there were over 450 children in the school. In October workmen started to build wooden huts for additional space, they opened in January 1932. They were supposed to be temporary buildings, but lasted until 2003. Another wooden hut was built as the 'school meal centre' in 1939, at the nursery end of the school. This was closed in 1983 and demolished in the 1990s. The school building was altered for a new nursery class during 1947. During the 1950's the school building changed at the back. Corridors and toilets were built on to the school. October 1959 - Gas fires were fitted to the headteacher's room and staff room. February 1986 - an un-used classroom was cleared and converted into the school library, this room was converted again in 2000 to become our computer suite. 1999 - A main school entrance was added at the back of the school building, (there was no where for it to go at the front). During 2002/3 the school raised the money to demolish the old wooden huts and replace them with two new classrooms. 2008 - A new child centre was built onto the end of the school. Many of the school log book entries tell of staff starting and leaving, and their absences. Some comments are made about teachers coming late or not doing the register properly. There are also records of visits by School Inspectors, doctors and dentists. There is a record of staff meetings at the school - just one each term, (now they are held every week). The first meeting was held on 2 July and the subject was; "Registration and Routine". There were very strict rules for teachers about completing the registers correctly - any mistakes made by the staff were noted in the log book. During the 1930's the school was very over-crowded. In 1933 children from the aerodrome huts were admitted, they were the children of the Royal Air Force personnel - Castle Bromwich Airfield became the base for 605 Squadron. 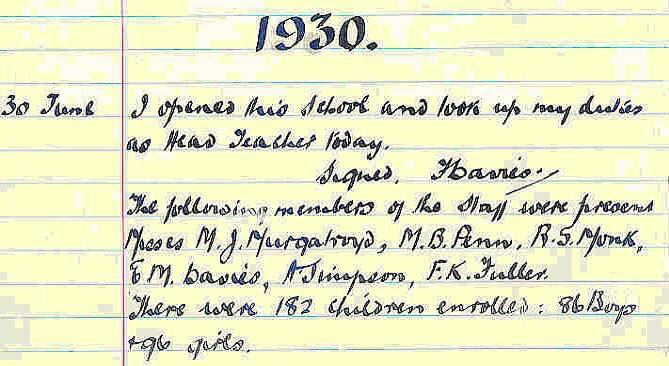 In May 1933 the school reached its maximum number of children recorded - 627! Where did they put them all? They must have been squashed like sardines into the 10 classrooms - over 60 children in each! Gunter J.I. School Staff - Early 1930's - We know the man standing in the centre is Mr F.Davies - can anyone identify the others? 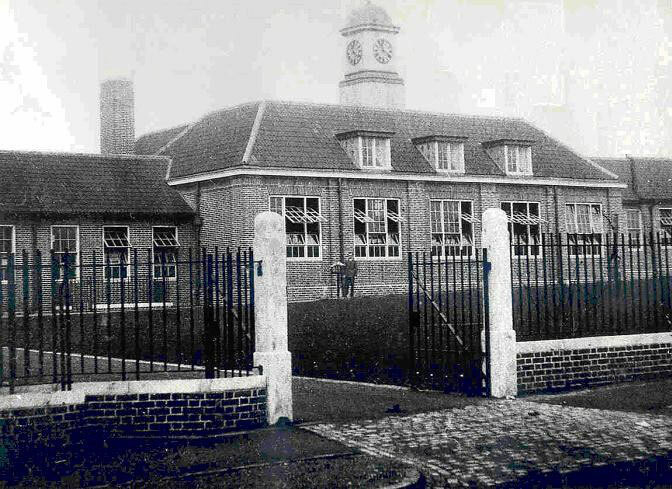 Although the roll fell for a few years, the Eachelhurst Road estate opened in 1937 and the school continued to have over 50 children in each class until 1939. Because the school was so large it had 2 deputy headteachers from 1938 - there was already a 'Chief Assistant Mistress' (deputy head), so the school appointed a Chief Assistant Master. The nursery class opened in September, 1947. In the 8 main classes there were between 32 to 47 children, (350 + 30 nursery children altogether). 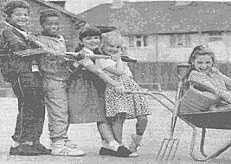 Once again the school grew in numbers in the 1950's while more council estates were built around Pype Hayes. Children from the Shard End estate were brought here in a special bus. It took two sittings for school dinners. The roll went back up to 494 + 25 nursery. From 1952 to 1954, St. Mary's Church Hall was used as a classroom due to overcrowding. When other primary schools were opened, our roll went down, but only for a little while. In 1955/56 children from the new Firs Estate were admitted to our school. Two buses were used. The school roll was 420 including the nursery, rising to 454 by April 1956. When the Firs Primary School opened our roll went back down to 315 in September, 1956. January 1978 the Nursery was reorganised so that 57 part-time children could attend. In September 1983 the Reception class was changed. Parents could send 4 year olds to school, before this they had to be 5 years old. Gill Jones (later Gill May) became the first classroom assistant for these 'rising-5's'. By 1985 the school had maintained its popularity and was heavily oversubscribed. The LEA would not allow the school to expand any more and only allowed children in from a small area around the school, (called a 'catchment area'). This became a major problem as year after year the LEA refused to let children in to our school. In 1988 a major campaign was mounted by parents against the LEA. Some children were kept at home in September until a place could be found in this school for them. In 1989 brothers and sisters of children already in school had to be turned away because of the LEA rules. The parents were very angry and mounted another protest which was printed in the newspapers. Erdington's M.P. (Robin Corbett, later Lord Corbett) supported the school and the LEA eventually allowed the school to take a further 15 children - but over 20 others were still turned away. During the late 1990's the school roll fell very fast as families were moved out of the area and all of the houses on the Pype Hayes estate were demolished. The roll went down to just 150 in the main school, and 39 in the nursery. From 1999 the school roll gradually rose again as new houses were built. During the 1930's and 40's, most of the children moved on to Paget Road Senior School at the age of 11. Some went to selective schools. Transfers took place at Easter as well as Summer. From the 1950's the top class took the 'Secondary School Admission Examination' which was known as the '11 Plus' to decide which school they would go to in September. During the 1970's the 11 plus was scrapped - only a few schools kept entrance exams. Our children now move to many local secondary schools in the area. 30th June 1930 - Gunter School's First Day. The school has made a promising beginning. The Head Master has appreciated the needs of young children and under his helpful guidance and with the able support of his staff much sound work has already been accomplished. The children are happy and industrious, vigorous yet self-controlled... Formal work is gradually introduced and by the time the children complete their infant course they have acquired a good foundation in 3 R work, a readiness of speech and a healthy curiosity in their interesting surroundings... In the Junior classes the interest and active co-operation of the children is maintained and their general development continues..."
So in general - well done everyone. The full report was just 1 page long. [3 R work - Reading, w'Riting, and a'Rithmetic - today we call it English or literacy and maths or numeracy]. During the 1930's the junior classes were 'streamed', (children in classes according to their ability). Now the classes are all mixed-ability. The first sports day was held on 25 June 1931. Gunter School started to achieve early success in sports. During June 1932 the school was closed for two afternoons so that the children could take part in the Erdington School Sports event, (athletics). Boys events were held on one day, girls' the next. In the following month the school closed for another 2 afternoons to hold our own school sports. In September one of the rare staff meetings was held about "Organised Games". 1 March 1939 - "Visit of King and Queen to City. School closed all day." Donald Allen, a pupil 1936-1940, now 80 years old, contacted this site. He is the blackbird, 2nd row 3rd from the left; below he is the page boy at the front. He remembers during the War a delayed action bomb falling in the garden of 63 Gunter Road. May 1939 - The first sign of the coming war - "New fire gongs delivered and fixed." It was expected that Birmingham would be bombed if war started and plans were made to evacuate the children to the countryside where they would live with other families. 28 August - "School reopened today [after the Summer holidays]. 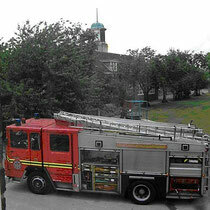 Ten of the staff arrived late, owing to evacuation rehearsal at Canterbury Rd School." 31 August - "School closed - Evacuation of children. All staff present at Canterbury Rd School.".... the school remained closed until 18 October when it reopened on a 'voluntary basis' for Juniors only. Some staff went with the children who were evacuated, those left in Birmingham met twice a week at school. 23 October - "Work commenced on Air Raid Shelters." The air raid shelter was very large and could shelter all of the children who were not evacuated as well as some of the adults that lived in Gunter Road. 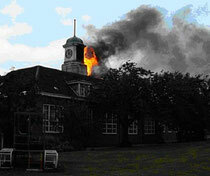 30 October - School reopened for Infants who had not been evacuated. April 1940 - Building of the Air-raid shelters was completed. The school reopened on a compulsory basis for children who had not been evacuated. May - the Whitsun holiday was shortened on instructions of the Board of Education. This was to allow factory workers involved in war production to go to work. Later in the year the Summer holiday was shortened to just 2 weeks. June - Mr R.E. Jones a teacher at Gunter School joined H.M. Forces. 13 August - "Air Raid during the night. 129 children present this a.m." Pype Hayes and the surrounding area was a major target for German bombers because of the nearby airfield and all the factories around us. Many of the factories were involved in making parts for aircraft. 26 August - "Air Raid during the night. 62 children present. School closed on instructions from Education Office." 27 August - "Delayed action bombs in the vicinity of the school. School closed for 2 days." 29 August - "Only 12 children present." 3 September - "School closed. Delayed action bombs." 4 September - "School open and Registers marked in a.m. pending instructions from Police. At 11.45 a.m. police would not give clearance order. School closed p.m. on instructions of Education Office." 10 September - "Registration of parents of children for evacuation begins." 11 September - "Air Raid alarm at 11.5 a.m. Children in shelters until 12.30." 26 September - "217 children evacuated to Derbyshire. Miss E.M. Davies left in charge of school." Mr. Tony Ellis, a former pupil, remembers being taken to Castle Bromwich railway station with his sister to be evacuated to Eggington, in Derbyshire - complete with labels attached to their clothes. 11 March 1947 - Exhibition of children's work and hobbies in the school hall. These continued until the 1980's. May 1947 - Football; Gunter v Slade Road in the HMS Birmingham Shield. Result 2 -1 to Slade. 20 November 1947 - School closed for the wedding of HRH Princess Elizabeth (later Queen Elizabeth II). 26 April 1948 - School closed for the Silver Wedding of the King, (George VI) and Queen Elizabeth, (Queen Elizabeth II's mother). 11 May 1948 - School closed for visit of King and Queen. The majority of the children were taken by the staff to line the route at Kingsbury Road. In November 1948, two classes took part in the District Schools Musical Festival. Class 1 were selected to perform in the final concert with 2 songs and percussion. From the 1940's to the 1970's the school had choirs, performances, and instrumental lessons on the violin and brass instruments with visiting teachers. There were also regular visits to the school by sections of the Birmingham City Orchestra. Sadly during the 1980's the visits to school by the Orchestra and others were stopped (by them, not us). Children had to pay for their individual music tuition and not many could afford to do so, even the visiting music teachers were stopped. Now we only have performances by others when the school can afford to pay for them. March 1949 - The school football team won the Erdington League Shield without losing a match all season. 27 May 1949 - "It is with deep regret that I have to record the death of Christopher Sanders, aged 6, who was knocked down by a motor lorry in Eachelhurst Road at 12.35 today." March 1950 - The school football team wins the Erdington Shield for a second year, again without losing a single match. Throughout the 1950's to 1970's a needlework teacher worked in school for 2 hours a week - she only took the girls for these lessons, the boys did other craft work. June 1951 - 12 children took part in a dancing display at Villa Park before HRH Princess Elizabeth (later Queen Elizabeth II). 13 June 1951 - "120 children and 13 staff visited the South Bank Exhibition in London [The Festival of Britain] and had a most enjoyable and instructive excursion." May 1952 - First record of a school house system. In the sports the teams were recorded as : Falcon; Hawk; Eagle and Swift. 'Swift' later became known as 'Kestrel'. 6 February 1952 - King George VI died, the reign of Queen Elizabeth II began. 1952 - The school cricket team are runners-up in the district championship. March 1953 - "The price of school meals was increased from 7d to 9d [d = old pennies; 9d = 4p] for children and from 1/3 to 1/5 [1shilling / 3d - 5d; 1/5 = 7p] for the staff." This was the cost of meals for one week. May 1953 - To celebrate the coronation of Queen Elizabeth II - "School Sports, as part of the Coronation Celebrations, were held in Pype Hayes Park." The Junior classes attended a Coronation service in St.Mary's Church. The school closed for Whitsun and the Coronation of Queen Elizabeth II. November 1953 - school hours altered for the afternoons: 1.45 to 3.30 for infants; 1.45 to 4.00 for juniors. March 1956 - polio vaccinations began. April 1958 - School football team win the league and the Harry Barford Memorial Shield. May 1959 - School football team win the league again and the District Cup. 18 March 1960 - the first record of a break-in at the school. 6 May 1960 - school closed for Princess Margaret's wedding. 1960 - Our cricket team are runners-up in the Erdington League. June/July 1960 - Girls' Skittle Ball team are runners-up in the Erdington League. July 1963 - Cricket team win the Erdington Schools Championship. June 1964 - Boys athletics team win the Erdington Athletic Shield. The Relay Team go on to win the Birmingham Relay Trophy and then the All Birmingham Primary Trophy. June 1965 - Police started cycle training at school. December 1966 - The first Christmas Fayre was held and raised £67. This was quite a lot of money in 1966. May 1968 - The school swimming team won the 'Smaller Schools Swimming Trophy'. June 1968 - Girls skittle ball team win the North Area Cup. 19 November 1969 - One day teachers' strike. Other strikes with teachers and the gas closed the school on various days throughout the 1970's. September 1970 - the school replaced its maths books and some of its equipment for metrication (from feet/inches etc. to metres/cm etc.). Decimal currency - £ and p - was also replacing the old pounds, shillings and pence - £.s.d. The official start of the 'new money' was in February, 1971. The first recorded charity collection was in 1970 with the Pakistan Disaster Relief fund. The school has since contributed many thousands of pounds to all sorts of charities. Many of the charity collections are organised by the children including collections for Blue Peter and for leukaemia research. 1970 - Skittleball team win the League Cup and the Tournament Cup. June 1970 - Chess team runners up in the League. July 1970 - New trophies were presented in school - Sportsboy of the Year : Geoffrey Whitehouse - Sportsgirl of the Year : Frances Warmington. 1971 - Netball team win section shield. July 1971 - Cricket team win Erdington Shield. July 1971 - a pupil from Gunter School, David Baker, played for Birmingham School Chess. 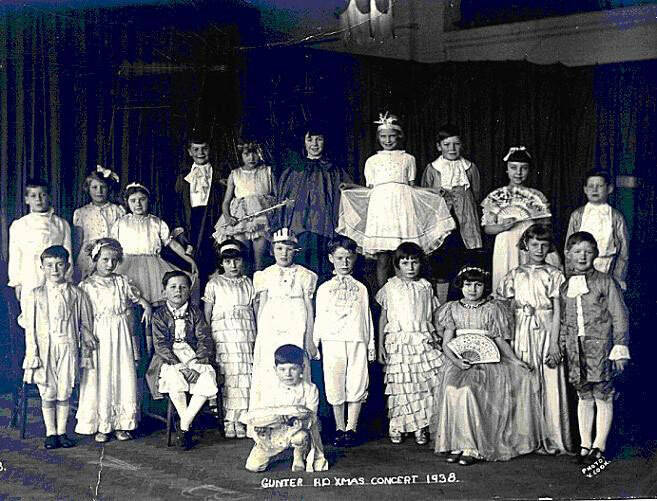 Christmas 1971 - the school's productions were major events - every class presented a play - and with so many children, it took 3 afternoons to do them all. March 1972 - David Perry is killed in a road accident on Tyburn Road. A memorial service is held at St.Mary's Church. During 1973 a major safety campaign in the school is held mainly concerned with road safety. The school also mounts a campaign for a zebra crossing on Tyburn Road. June 1972 - School free milk was cut by Margaret Thatcher, the Education Minister, (later the Prime Minister). July 1972 - The school celebrated that the country was joining the European Community, (EC, later called the European Economic Community [EEC] and usually called 'the Common Market'). An exhibition was held with the title 'Going Into Europe'. Every class took part and the school hall was filled with art, craft and writing. July 1973 - 3rd and 4th year junior netball teams won shields. July 1974 - On the first day of the holidays, Lee Harries one of our infants, fell into the canal and drowned. 12 June 1975 - 30 children and 3 staff went to Blankenburg in Belgium for four days. The visit included a football match with a local school. The cost of the visit was £28 per child. This visit was repeated the following year - "Thirty children departed for Belgium with myself [Mr Jones] Mrs Prosser and Mrs Whiting. We visited Brugge in Belgium and Sluis in Holland. One of the highlights was a procession of pedal 'go-carts' proceeding around the streets of Blankenburg led by myself riding a hired bicycle." 11 November 1977 - A group of pupils planted trees in Pype Hayes Park organised by the Tree Lovers' League. As well as planting trees, the children entered art competitions where pictures were made with autumn leaves. The school continued to work with the Tree Lovers League until the organisation died out in the late 1980's. 16 December 1977 - Funeral of Darren Gibbs, a first year junior killed while crossing Eachelhurst Road. The third pupil at Gunter School to be killed in a traffic accident on local roads. 1979 - a school Scout and Wolf Cub pack opened in school. The school also ran a gardening club, a music club, gymnastics club, chess club, football team, netball team, and a rounders team. 16 May 1980 - A group of children spend the weekend at Atherstone Hostel. The first of many to be held over the years. June 1980 - The school's Golden Jubilee Celebrations - exhibitions, ex-pupils invited back. 30 June - Service of Thanksgiving; Jubilee Fancy Dress parade; "A yard square model Jubilee Cake made by the nursery was wheeled in and at a given signal out of it popped little Sarah Byrne in fairy costume." Jubilee mugs were given to the children. 1981 - A school bank is opened for the children to use. 1983 - the first computer courses for teachers are held. The first computer in school was a RML 380z, it used a tape recorder to load programs. These programs were always small and yet could take up to half an hour just to load one - often during the process of loading the system would crash. In 1987 the school had just one computer and a disk drive was fitted for the first time. We did not get our second computer until 1989. 19 March 1984 - Gunter and five other schools presented plays on Crime Prevention in the school hall. 13 April 1984 - the Easter Service was followed by an Easter Bonnet parade by the nursery around the local roads - later this is expanded to include every class in the school. February 1985 - 10 children took part in a drama festival. March 1986 - A Friends of Gunter School Association (FOGSA) was started up, (there was a parents' association in the 1930's). April 1986 - Keep Fit lessons for parents were held in the hall on Wednesday mornings organised by FOGSA, (Year 6 girls joined in for last part of these sessions). 22 April 1986 - "Great excitement at lunchtime - dinners are now served on plastic trays [instead of plates and bowls] - and the food tastes quite different apparently." 25 April 1986 - First school disco held after school, partly organised by FOGSA. 25 June 1986 - Gunter School Fete organised by FOGSA. The fete becomes an annual event again. Dancing and judo displays and many stalls. June and July 1986 - several visits by the police - officers, police horse, motorcycle , car, police dog display. 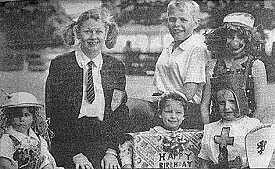 10 June 1987 - 2 of our children, Sharon Murray and Michelle Cornwall, were selected to meet Princess Diana when she opened the new Barnardo's. June 1987 - Schools were now required to write an annual School Development and Action Plan. In July the first official Annual Parents' Meeting takes place. These meetings are compulsory, but are rarely attended in most schools. We have had to hold meetings with 0 parents attending - on one occasion we gave a certificate to the one parent that turned up. September 1987 - School re-opens with a new contract imposed by the government on teachers - 190 days for the children + 5 additional training days for the staff. June 1988 - Preparations began in school to train teachers ready for the new National Curriculum. Up until this time, the school wrote its own syllabus for each subject. Then the National Curriculum started with 10 primary school subjects - 3 core subjects: English, Mathematics, Science - 6 Foundation subjects: Art, Geography, History, Music, P.E., Technology - and R.E. 20/21 October 1988 - A major Road Safety exhibition was mounted by Gunter School in the Bull Ring Centre organised by Mr.Sanders. Every class contributed work with Class 7 taking the lead. On previous education displays various groups of schools shared the space - we took the whole of the Bull Ring display area all on our own! Funding was raised through sponsorship - our exhibition included a road layout made from rubber matting supplied by the nearby Dunlop Rubber Company. Small bikes and tricycles were supplied for toddlers to ride around the road layout. Later in the day a parent of one pupil brought along a Sinclair C5 battery operated mini-car which could be used by the pupils and visitors. The police turned up to support the exhibition and brought a police motor cycle into the Bull Ring. The exhibition appeared on the television that night. 10 November 1988 - A group of North American Indians spent the day in school, teaching myths and legends, Indian stories, costume, dance and songs. 10 November 1988 - A team took part in the non competitive local Maths Olympiad - Vicky Hughes Class 7 won a prize calculator for excellent work. 15 November 1988 - the first 'Tuesday Club' for after school junior activities was started. 29 November 1988 - INTERNATIONAL ART SUCCESS! Gunter School won the Amnesty International Art Competition!! We were selected from many hundreds of entries and won overall best school first place - beating even secondary school entries. The competition was difficult - to illustrate a word such as 'Free'. The first place junior individual winner was David Tutt - his painting was used to decorate the cover of the UK edition of the Universal Declaration of Human Rights - sadly he was on holiday for the actual prize giving event in London. Mr.Sanders took the four other winners - Victoria Hughes, Matthew Lee, Thomas Anslow and Nicholas Jones - to the ceremony. They were given a tour of the Foreign Office, the House of Commons and then invited for 'tea' in the House of Lords. The pictures remained on display in Westminster Hall and then went on show around the world at United Nations exhibitions. Later, back at school our M.P., councillors and other officials came in to school to meet the children. March 1989 - we participate in the Birmingham Primary Science Group - Problem Solving Competition. 13 June 1989 - Phillipines Yo-Yo champion visited school and gave an exhibition. 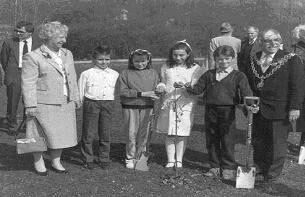 April, 1990 - Children from Gunter School are planting trees in Pype Hayes and Cannon Hill Park. Here seen with the Lord Mayor of Birmingham at a presentation. Mr. Derryk Cox, headteacher, stands in the background on the left. 25 June 1990 - start of the school's 60th anniversary week celebrations - exhibition of the school, visitors, school fete, fun run and a picnic. During the week Mr. 'Charlie' Cook, a former pupil from 1930 visited the school and talked about the early years at Gunter School - some of this history is based on his talk. Mrs May, classroom assistant, is the big schoolgirl in the back row. 3 January 1991 - 'Local Management of Schools' (LMS) began. Before this the LEA controlled nearly all of the money spent on the school - with LMS the school received the money it needed to run the school. June/July 1991 - First camps at the Stables Camping Centre for Year 5, and Kingsbury for Year 6. October 1992 - Mrs Keller organised the first special book week with many activities, competitions, visitors and a fancy dress parade of characters from books. This book week has been held every year since. 12 June 1995 - First OFSTED inspection - 4 days. Press comments afterwards :- "An Erdington primary school [us] has been praised by inspectors for providing a stable focal point while the Pype Hayes estate is undergoing major redevelopment.... "
November, 1995 - Gill May starts the 'Family Library' for parents and children. June 1996 - Major success with school-industry partnership projects. Following work in school and exhibitions of the school-industry links, the school was recognised for its achievements. National business representatives including Sir David Lees [GKN] visited the school. The school gained various rewards and resources. Year 5 visited Birmingham Airport as part of their reward in February, 1997. Mr Jenkins, the headteacher, visited Highgrove and met Prince Charles in July 1997. December 1996 - Follow up visit by HMI to check on OFSTED findings says the school is making good progress. 1997 / 1998 - Warwickshire Cricket Club send a member of their team, (Keith Piper, Wicket Keeper) for training sessions with Year 5. This link goes on. 12 October 1998 - Second OFSTED inspection - 4 days. 1999 - Drugs education courses began with P.C. Cahill. 1999 - National Literacy Strategy and then the Numeracy Strategy started in school. Click to enlarge the images in the Gallery below. The photographs were taken by Angela Reynolds' son. May 2000 - the netball team won first place in their area league. April 2001 - The ICT computer suite was opened by Estelle Morris M.P. and Robin Corbett M.P. April 2001 - The school launched a web site for the whole Pype Hayes community - www.pype-hayes.org - this was paid for by British Telecom after Mr.Sanders won a competition for teachers. The Pype-Hayes web site became gunterschool.org. The site was featured in a full page article in the Daily Mirror. September 2001 - Our web site was selected as one of the 'TOP 100' sites for educational use of ICT by the European School Network. March 2003 - Demolition of the temporary huts. June 2003 - Gunter School awarded with 'Investors In People' status. 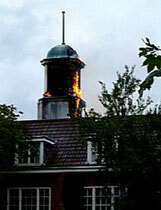 August 2003 - School clock tower set on fire. September 2003 - 2 new school classrooms were opened for use. June 2004 - Adam Hines in Year 6 won an art competition for Refugee Week.